Hello Lesley, thank you for taking the time to tell us more about The Hop Store. Firstly we’d love to hear a little about the property background. How did you come to acquire one of the last remaining hop farms? My husband was the manager of a large hop farm, however, unfortunately he was made redundant in 2003 and it was at this point we decided that we should take over his family farm as his parents wanted to retire. We bought the business and moved to Townend Farm in January 2004 with our young family, making Mark the 10th generation of his family to grow hops, three of which have operated here at Townend Farm since 1932. Where did you draw your interior inspiration from? I think my inspiration came from properties that we had stayed in over the years with our family. A family holiday is extremely precious, it’s where lifelong memories are made and I wanted to ensure that our guests felt they had made the right choice the moment they open the door. I wanted to create a space that felt like a home from home; a place that was comfortable and a colour scheme that was relaxing. I studied interior design with the KLC School of design in London and it was here where I learnt the rules of design, which have been invaluable in creating a space that works. I decided to use the first floor for the living area to make the most of the lovely rural views over the Malvern Hills. The living area was originally intended to be open plan, creating a space that is light and airy. Also a priority of mine was warmth and there is no better place to be in the winter than cosy by the fire. What is your favourite aspect of The Hop Store? I love the garden room. It was converted two years after we first had guests and it has been a fantastic addition. We were ecstatic when we were granted permission to fully glaze it, making it such a super place to relax and watch the wildlife. Also, when summer evenings become chilly being able to retreat into the heated garden room is amazing! The external lighting in the wooded area comes to life at dusk and I love looking for the barn owl that lives above. What do you enjoy most about the exceptional surrounding areas? Everything! It is a fantastic rural area that is off the tourist trail but still on the edge of the Costwolds. 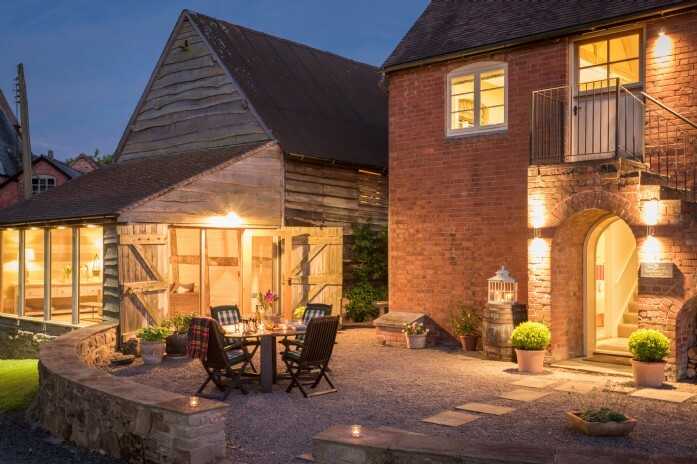 The fact that Herefordshire can grow a great diversity of crops makes us a great food destination and means the local market town of Ledbury has super shopping and amazing places to eat. In terms of drink, we are home to the producers of top quality beer and of course cider, wine, and the world renowned Chase distillery and Chase vodka. I could go on and on! Our main crops are hops and cider apples and it is very accessible. There is so much space here and we encourage guests to get out on the farm to watch the lambing, see the donkeys and talk to the sheep. What was your initial response once the property had been launched on the Unique Home Stays portfolio and we first started to receive bookings? I had been following the Unique Home Stays website for two years before we made the decision to make contact. With the growth of everything online and with no experience in marketing we knew it was time for a change, so we took the plunge, made contact and the rest is history. When our webpage went live we were absolutely thrilled, not only with the fantastic photography, but the whole very professional package and at last, we were where we wanted to be. We knew that we needed to do something very special to stand out and together with the Unique Home Stay’s team we have done it! I have to say that every booking we receive is very exciting. There now is a whole world at peoples’ fingertips, so when someone chooses to stay with us it feels very special indeed. How would you describe The Hop Store in three words? Thank you so much Lesley, it's wonderful to hear more about The Hop Store, such a unique property.